Think of the weight. It’s a huge chunk of metal and it’s right at the big end. It would really throw off the weight distribution. Plus I’m sure it would raise the cost of the light quite a bit. But JasonWW the light is already heavy i dont think a bezel would make much difference imo and i wouldnt call a 200$ cheap compared to MF01 or 02…. Chinese flashlight manufacturers are always trying to lower production costs as much as possible. If they can save a nickel here or a penny there they will because it adds up in the long run as higher profit. I don’t know how much extra it would cost them to make it in stainless over aluminum, but I would guess at least a few dollars. Then again, the sheer size of the raw material that they need to get to make it, plus the extra time it takes to machine the harder metal may increase the price $10 to $20. There are so many factors involved we may never know all of them. I think the only way to get them to do the stainless steel ring is convinced them that enough people are willing to pay extra for it. The last thing they want to happen is they do a small run of stainless rings at great expense and then nobody buys them. I think if enough people ask for it they might make it. Or at least figure out the cost to make it and see if we still want it. I already asked for a SS Bezel. I dont see a need for a SS bezel, to me its solely a cosmetic feature, and i dont use my flashlight to look good. Astrolux MF04 groupbuy is ACTIVE! Very interested. I'm in for one. How does the reflector compare to the illustrious BLF GT? Diameter, finish, depth.. I'm too excited to read onwards for answers, forgive if I find them that way. I've always been fanatical about searchlights, so naturally this has my interested piqued. Thanks for your GB and deal page! Thanks.. i think astrolux read your comment.. mf04 beam look great..
Just read a comment on aliexpress that his MF04 (MT35 Plus) CW was more NW than CW. Here is my mf02 neutral white and mf04 cool white.. Cool pic. Are the brightness levels low enough that the hot spots in the pic are really this size? No. : it look different in person.. If you put both on the lowest level, can you see any difference in the hot spot size? The bigger reflector should produce a slightly smaller hot spot (in theory) which is where the extra throw distance comes from. It would just be nice to confirm this theory since I don’t have two so closely similar lights. Has anyone measured their 04? Yes, lots of times. You want lux or lumen? Hardusvd70 measured 1.36mcd on his CW MF04. He got the same candela at 10m and 25m. I do the 25m calculations in post 2217. Incredible! Honestly thought it would only do maybe 1.1mcd max. So even more throw than a stock GT……. Mine doesn't go passed 0.9 million.. I really need to measure again.. and probably buy another meter. Mine doesn’t go passed 0.9 million.. I really need to measure again.. and probably buy another meter. 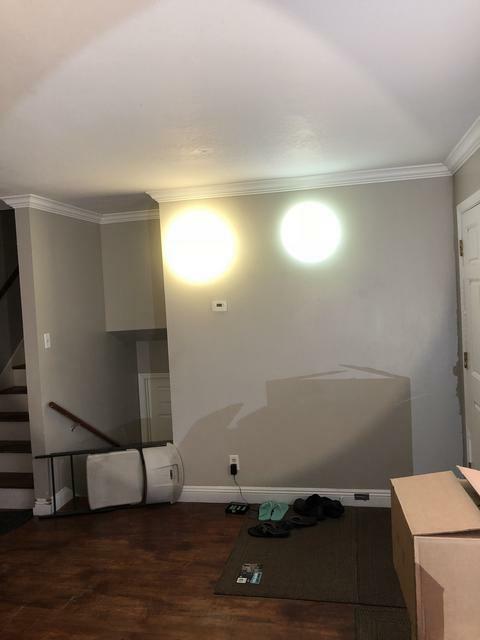 Maybe your LED is a bit off center? NW seems to give lower readings. Unscrew the bezel enough so you can lightly tap the light and nudge the reflector (in whichever direction you need) just enough to center the emitter with the centering ring. Worked for me. Not meaning to flood with posts but my MF04 had smoke coming from the emitter?…..now no more smoke after ran it on turbo a few times. Uhhh is that normal? I’m thinking maybe some sort of residue was getting burnt up. It might have been leftover liquid flux. There were a couple of GT’s that had that. Never thought of that. Now it makes sense, flux smoke. Got 980K max Lux measured @14m on a UNI-T Luxmeter. Emitter is not properly centered though. After recalibration 1.05M Lux. Emitter is still not 100% center, I might try again later.